Edward the Confessor was the son of Aethelred II. Edward was raised in Normandy where he lived until he was called to the throne in 1042 upon the death of Harthacnut(Hardicanute). During his reign, power truly resided in the hands of the Earl Godwin, whose daughter Edgitha was married Edward. It was Edward who restored Malcolm to the throne of Scotland, which had been usurped by Macbeth. Edward also instituted legal reform by revising the Saxon laws with amendments, which thus formed one body of law for England. He also ordered the translation into Latin. Edward maintained a relationship with William Duke of Normandy and consulted him, as the story goes, about the choice of a successor. 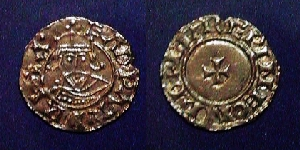 This was later used by William as his claim to the throne of England following the death of Edward on January 5th, 1066. There is little doubt that the death of Edward the Confessor in 1066 would forever change the course of English history. Edward the Confessor died without leaving a son to succeed him. His nearest relation, Prince Edgar, had lived in exile for much of his life in Hungary and was virtually unknown in England. There was no obvious, undisputed candidate for the vacant English throne. William, Duke of Normandy claimed that the Edward had bequeathed the throne to him. He immediately began preparations to invade to enforce his claim though there was no support for him within England itself. William thus gathered his forces and crossed the English Channel. Across the North Sea in Scandinavia, King Harald Hardrada of Norway prepared a Viking fleet to invade and seize the country, as his predecessor, King Cnut had done forty years previously. In England, the greatest of the English nobles, Earl Harold Godwinson of Wessex, was hastily crowned king at Westminster Abbey by a section of the English nobility on January 6th, the day after the Edward’s death. But support from the English nobility for Harold was not unanimous. One of his own brothers, Tostig, attacked various parts of southern and eastern England in the spring and summer, and Harold could not rely upon the support of the nobility of northern England either. In the early part of 1066, there were three major armies assembling in Scandinavia, in Normandy, and in southern England, while lesser forces under Tostig and the northern earls were also preparing for battle. In the spring of 1066, the skies were lit up by the appearance of Halley’s comet, which was believed to foretell that disasters of world-shattering importance would happen in the near future. To those viewing Halley’s comet from England, Normandy or Scandinavia, it was easy to believe that the comet prophesied disaster for either the English, Viking, or Norman armies, or for their leaders. The events of the next few months were to prove this to be the case.